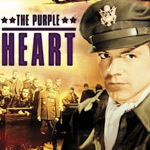 The Purple Heart, from 1944 is now available on DVD for the first time ever. Produced by Daryl F. Zanuck, directed by Lewis Milestone (All Quiet on the Western Front, 1930), and starring Dana Andrews (Laura, The Best Years of Our Lives), The Purple Heart tells of eight American flyers on trial in Japan. The story is about a kangaroo court in which the eight Americans are tried for murder. All eight were part of the Doolittle raid on Tokyo (look for 30 Seconds over Tokyo on TCM if you haven’t already seen it.) All of them had to bail out over China, and they were all captured by a Chinese governor who turned them over to Japanese authorities. These issues are raised, but the movie focuses on the positive values of Americans, and not on the dirty tactics used by the enemy. The prisoners discover that they will all be tortured, one by one. Each man faces an internal struggle as he contemplates how he will cope. Each desperately hopes he will not reveal information to the enemy, but none of them can be sure. The airmen’s other heroic struggle, according to the movie, is their decision to vote on whether to sacrifice their lives rather than to tell the Japanese what they want to know. They face execution when (not “if”) their guilty verdict is handed down, but if they cooperate, their lives will be spared. It’s almost strange that there isn’t more condemnation directed at Japan. There is a sense of resignation that probably reflects the fact that this movie was made during the war. There is no time for talking about morals and ethics. The film takes a matter-of-fact view of Americans being tortured, and it praises these men for facing unjust treatment so stoically. It doesn’t try to solve the world’s problems by focusing on injustice. It takes injustice for granted and shows how American fighters should face it. The movie hasn’t aged as well as some other films from the same period. There are obvious stereotypes of Japanese and Chinese characters, including some not-very-authentic sounding Asian dialogue. It’s a little embarrassing by modern standards, but there were much worse caricatures elsewhere in popular culture at that time. The Purple Heart also seems to suggest that any man can withstand torture if his will is strong enough and his cause is just. It’s an odd message, because it blames the victims of torture for not being strong enough to take it like a man. Still, as propaganda, this is exactly the message the U. S. government would want to send to its armed forces during wartime. The DVD has an audio commentary by Time magazine film critic Richard Schickel that is informative though uneven. Schickel is prepared with stories about the movie and about the period in which it’s set. But he is clearly engrossed in watching the movie and there are long pauses between comments. Also, The Purple Heart is about the trial of the eight airmen, whereas much of his Schickel’s early information is about the Doolittle raid. A little background information is good, but most of the comments would have been better saved for a DVD commentary on 30 Seconds over Tokyo or Pearl Harbor. It’s a lost opportunity to really focus on the events of this film, which is almost entirely set in a courtroom, and not on the aircraft carrier or in the bomber itself. Still, when Schickel is talking, he comes across as well informed. He gives insight into the careers of director Milestone and producer Zanuck (who also wrote the story and is credited as Melville Crossman). Schickel is especially insightful about Milestone’s strong suits; he states that Milestone is better at individual scenes than at whole movies, and that high-contrast black-and-white cinematography is something Milestone excelled at. Schickel also shares some facts of the actual case on which the movie is based. For example, in real life only three of the eight were executed and another died in prison. All in all, The Purple Heart is an interesting movie from the war era. When you’ve exhausted all the truly great films from this period (including The Best Years of Our Lives), give The Purple Heart a look.